Make your next family reunion or office party truly unforgettable with catering service from La Estancia Churrasqueria of Falls Church, Virginia. In addition to our restaurant location and catering service, we also make and sell our own chimichuri sauce so that you can take a little bit of us home with you. 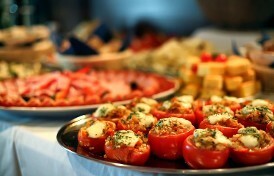 We have a special catering menu to accommodate all types of events and functions. Our barbeque master brings the grill to your location to cook the parrillada fresh for you and your guests. Please book our catering service at least one week prior to your event. This is a delicious steak sauce we make in house from our own recipe that is under Patent Review. It is a garlic-based sauce that enhances the flavor of meat or that can be used on bread as a spread. Our chimichuri sauce is available in 8 oz., 16 oz., and 32 oz. bottles. Contact us to schedule a day and time for your catering service.